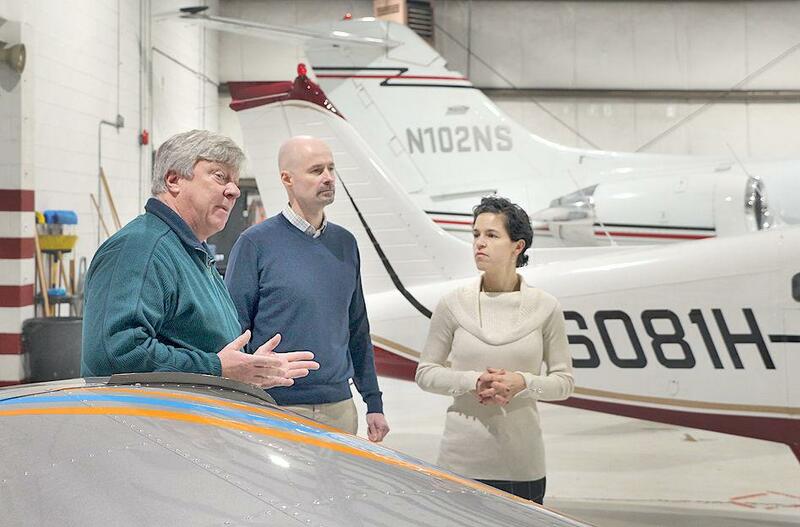 Flying.org co-founder Melissa Pensiero tours John Murtha Johnstown-Cambria County Airport’s main hangar Friday, January 25, 2019, with Nulton Aviation General Manager Mark Monroe (left) and airport manager Thomas Keyes. Chad and Melissa Pensiero want young people considering career paths to know the sky is the limit. The Somerset County natives have launched Flying.org, a nonprofit organization to promote interest in aviation-related careers and support training. Chad Pensiero is a professional pilot for United Parcel Service. Last week, he was in Europe. “Our mission is to inform, enlighten and provide financial assistance to anybody who wants to pursue a career in aviation,” Melissa Pensiero said at John Murtha Johnstown-Cambria County Airport. A growing shortage of qualified pilots has airlines, air freight providers and industry leaders exploring new approaches to recruitment and training. Aircraft manufacturer Boeing estimates that 790,000 new civil aviation pilots, 754,000 maintenance technicians and 890,000 cabin crew will be needed over the next 20 years. Many experienced pilots are reaching retirement age at a time when demand for aviation service is exploding. In the past, airlines and aviation businesses relied on former military pilots to fill their aircraft crews. But due to the use of drones and the military’s own recruiting challenges, there aren’t as many pilots in the military as there used to be, Melissa Pensiero said. Flying.org has leased a Johnstown airport hangar for its base of operations. Plans are to open an office there and display aviation information and equipment. Although the nonprofit may eventually get its own plane, Pensiero said there are no plans to start a flight school. Flying.org expects to work closely with Nulton Aviation’s flight school and its partnerships with area colleges. Airlines and air cargo companies may step forward to support the local organization’s mission, she added. Lockheed, for instance, has developed an aviation-themed science, technology, engineering and mathematics curriculum that Flying.org could bring to area elementary schools. At this month’s airport authority meeting, Chairman James Loncella said the Flying.org mission of promoting aviation fits well with the authority’s push to expand the use of Johnstown’s airport.